What lessons did Ireland really learn from the recession? 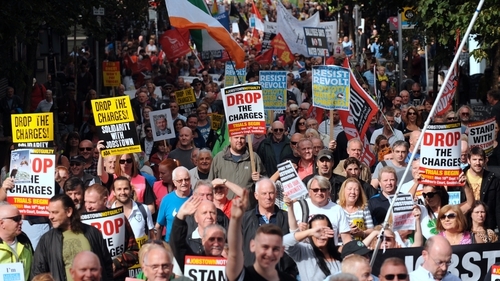 "The water protests provide a blueprint for how to generate a successful social movement"
In 2015, the Fine Gael and Labour government introduced a water charge. This was during a period of economic recovery when people who had endured austerity expected to benefit from a booming economy. But the charge was understood by many as a continuation of austerity measures. It violated their expectations of fairness. People had enough. They took to the streets. The ways in which people understood and reacted to the economic crisis and recovery reveal lessons learned. The water protests provide a blueprint for how to generate a successful social movement. Other campaigners, including the Repeal the 8th social movement to liberalise Irish abortion laws, could take inspiration from this blueprint to create a more just society. Relatedly, another lesson learned from the unforeseen economic crisis is a need for greater plurality of expert viewpoints to help make sense of the current and future state of Irish society. Politicians and economists have the greatest influence, but expert voices aimed at understanding lived realities behind the statistics are needed. At present, the most obvious lessons we haven’t learned are how to fairly manage housing to care for the most vulnerable in society. In Ireland, we have learned to develop prolonged social movements to effect social, economic, and political change. Irish people have protested en masse before, such as the anti-war demonstration in 2003 against the Bush-Blair invasion of Iraq. This did not stop the war or US troops passing through Shannon airport. However, the prolonged national, local, and online demonstrations against water charges, which lasted over a year, provided a model of how to conduct an effective and sustained campaign using multiple strategies to achieve a clear goal. One aim of the Right2Water social movement was to abolish water charges. As I quickly realised in my research with these protesters, another was to highlight a plethora of injustices revealed during an unequal economic recovery. Protesters were concerned by perceptions of unfair allocation of economic resources for healthcare, disability services and respite care, increased taxation and cost of living and the spiraling homeless crisis. What started as a demonstration against water charges developed into a prolonged social movement aimed at overcoming perceived injustices. Water charges were abolished. A general election was called, with independents gaining more parliamentary power. A blueprint for effective protest was established. In Ireland, there is a history of violent rebellion, or acceptance of hardship, but very little in the way of peaceful demonstrations. This multi-dimensional and sustained social movement incorporated street protests and social media campaigns on local and national levels. Facts were reported, exemplified by personal stories, and shared across media platforms. "This multi-dimensional model, derived implicitly or explicitly from the water protests, was adapted, modified, and extended in the campaign to liberalise Irish abortion laws"
This multi-dimensional model, derived implicitly or explicitly from the water protests, was adapted, modified, and extended in the campaign to liberalise Irish abortion laws. During my ethnographic work during the water protests, I observed volunteers handing out literature on Repeal the 8th which was deigned to form an explicit link between the winding down of one effective social movement and the ramping-up of another. Despite differences between these campaigns, the blueprint for one acted to help plan and frame the development of the next social movement. In both cases, sustained social movements reduced inequalities. People have also realised if we want to continue working towards a more just and fairer society, greater diversity of expert viewpoints concerning the everyday realities behind economic statistics, is needed. In 2016, the Nobel Laurate Paul Krugman described a stark 25 percent increase in Irish GDP, as a result of the relocation of intellectual property from tech firms to Ireland, as "leprechaun economics". A letter published in the Irish Times encapsulated public distrust of economic commentators on the state of Irish life. It stated "Paul Krugman has compared our GDP figures to "leprechaun economics." How ludicrous. Get with the times, Prof Krugman. Nobody believes in economics any more. – Yours, etc, Patricia O’Riordan, Dublin 8." Beyond the brevity, the satire suggests another lesson learned from the recession and recovery: the Irish public’s call for greater diversity of viewpoints in the public sphere. The main commentators on Irish society are either politicians or financial experts and economists. But failure to meaningfully predict the economic recession, the decision to bail out the banks at the expense of the taxpayer and espousing aggregate economic recovery without detailing its inequalities has led to a call for a greater plurality of expert viewpoints in the public sphere to understand how people make sense of, and experience, economic trends. Politicians are often self-interested. Economics is as soft as any social science. The public learned expert voices from psychologists, anthropologists, philosophers, legal scholars, writers and others are needed to have nuanced debates about economics and society, hardship and inequality, and fairness and justice. A lack of political will, skewed allocation of economic resources, an unequal economic recovery, and individual greed have all contributed to the contemporary housing crisis. Homelessness is going from bad to worse, with close to 10,000 people homeless in Ireland during one of the wealthiest periods in our history. Full time residential and respite care for people with learning disabilities is a major housing and economic problem. We have not yet learned how best to develop, and fairly allocate, housing in Ireland despite its major role in the 2007-2008 economic crisis. If we have learned, solutions to these problems are not being implemented quickly enough to alleviate pressing problems. The most vulnerable in Irish society are being crushed beneath charts indicating aggregate economic growth. Social scientific evidence illustrates how vulnerable people often suffer because they come to see the systems in which they live as legitimate, unchanging, natural, or just. Realising this is not always the case means tolerance for inequalities can reach a tipping point and gives way to civic unrest. The water protests are one example of this tipping point dynamic. The continued marginalisation of vulnerable people, as the rest of society continues to prosper, provides tinder for another social movement aimed at decreasing inequalities. Recent social movements provide a blueprint to generate social change. Dr Séamus A. Power is a Postdoctoral Fellow in the Department of Comparative Human Development at the University of Chicago.